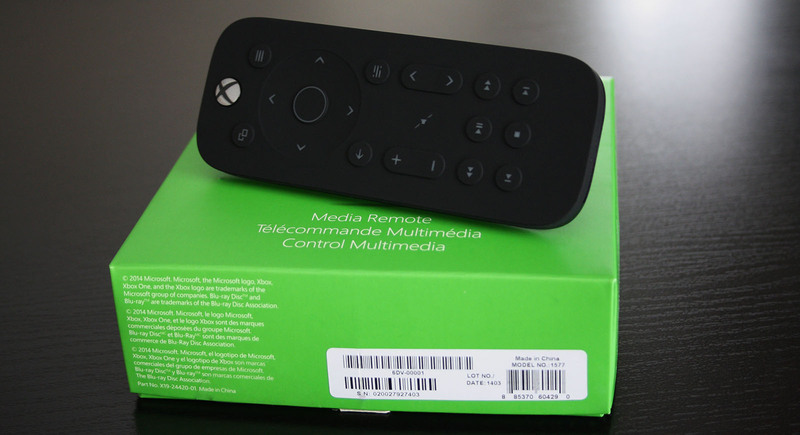 Released alongside the Stereo Headset, the Xbox One Media Remote is a small, well designed remote to control not only an Xbox One, but also any equipment you have set up in the settings for Kinect to control. I have my television and AV receiver set up through the Kinect, but disabled the options to turn them on and off automatically with the system. This allows the remote to control the AV receiver for volume, but since my TV isn’t set to turn on I still have to do that manually. The remote has a guide button at the top to exit apps and power cycle the Xbox One. Below that there is a view button on the left and menu on the right, similar to what you’d find on the Xbox One controller. Next in line is a directional pad for navigating the user interface, with an enter button inside it. Underneath is a OneGuide button, but since I don’t have the Live TV functionality set up it only shows my media apps. The volume switch on the remote changes the setting on my AV receiver, which is a nice touch. The other slider is for changing channels in the Live TV section. Finishing out the list are media playback buttons at the bottom to assist in controlling content opposed to using the controller (or your voice, of course). The remote has a soft feel to it that wraps around the back where the removable door comes off to insert 2 AAA batteries, with the initial supply being provided in the box. There’s an accelerometer built-in to detect motion that triggers a nice white glow to light up the keys. It fades out after 5 seconds when no motion is detected. The Media Remote is a great accessory for everyone, and provides a good amount of benefit to enhance the user experience.